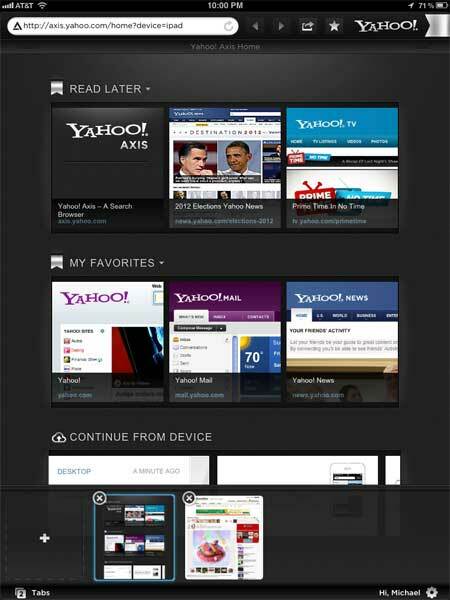 Yahoo introduced a new product called Yahoo Axis. This service is a combination of search engines and browser. Certainty is obtained after a number of media crews in US has received an invitation to Yahoo Axis event. From the email was revealed, Yahoo claims this service as a new virtual world explorer tool. Quoted from The Next Web, Thursday (05/24/2012), there are at least three excellent features offered by Yahoo Axis. That is fast, smart, rich design, connected experience and personal Home Page. Although referred as a browser tool, but the Axis actually not really a browser, at least until now, because the form is still a extension to an existing browser, like Chrome, Firefox or Internet Explorer. So when you download them, Yahoo Axis will only appear on the bottom right. The advantage is useful when you want to search something quickly.